Flight Test Gauge sets are available for CFS1, CFS2, FS2000, FS2002, FS2004, and P3D. The gauges are capable of displaying more than 30 different engine and aircraft flight parameters and can record tab-delimited ascii data for post-flight analysis. 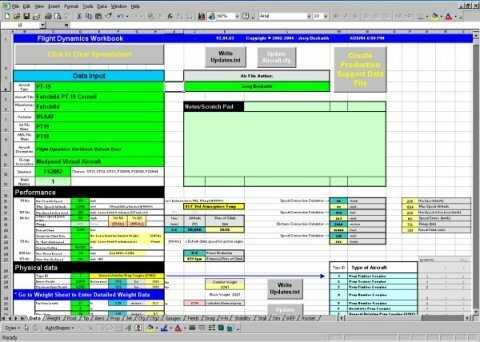 The Flight Dynamics Workbook is an Excel workbook designed to generate flight dynamics files based on the physical characteristics and actual performance of an aircraft. PLEASE NOTE: This tool may be difficult to use and it is no longer being supported or updated. 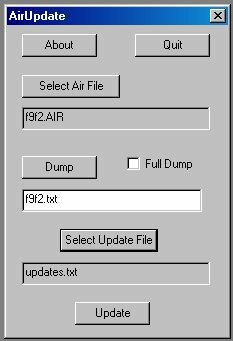 The AirUpdate air file editor is included with the Flight Dynamics Workbook. The following links are for downloading the editor alone.